Last night the police contacted my parents about an accident involving my brother’s car. Thankfully for us they had made a mistake in the number plates of the car involved and my brother is safe. Following this scare I am sharing this account of my own brush with death. I’ve wanted to pen it since reading Stephen King’s account of his own life-threatening incident where he was struck by a van and was severely injured. Thankfully he survived. I got lucky too. My account may not be completely accurate. Memory is not so reliable and hell, I got hit by a car. Besides, I’m a writer. I’ve a creative license and I like to use it. Spain 2009. My friends and I are holidaying and that morning we had taken part in La Tomatina, the famed tomato fight that takes over the Spanish town of Bunol. After heading back to our hostel in Valencia and cleaning the tomato juice from our ears we headed out to a club for our final night on tour. The previous night was the Water and Wine Festival in Requena and I had imbibed copious amounts of the latter libation. It was a wild night and suffice to say I nursed a terrible hangover the next day which meant I was not touching alcohol this night out at the club. A quick aside. If you want a hangover fix, try a tomato fight amongst thousands of people crammed into a single street. Maybe it doesn’t have to be tomato. Oranges perhaps? The adrenaline will brush aside any of the lingering symptoms of hangover. But wear expendable clothes. I was tired and bored at the club, so me, Smack and his fiancée, Queen decided to take a taxi home. As we crossed the street outside the club a car came around the corner. It was a pedestrian crossing so I assumed we were safe. Assuming that others are following the same rules as you is a great way to get yourself in trouble. But of course that’s what society is so what can you do? We saw that the car was not slowing down despite our incredulity so we hustled to get off the road. I remember reaching the safety of the curb (another silly assumption) and thinking to myself Alright. We made it. How wrong I was. All I remember is the sensation of something pressing into the back of my leg. My foot seemed stuck to the ground and so I toppled forward. The next thing I remember is the gurney being raised and then I was in the back of an ambulance. At some point someone tested my reflexes by running something along the base of my foot but that might have happened on the ground. At this point I was lucid enough to text message Smack, GET IN HERE RIGHT NOW. I was scared by the unknown and wanted the support of my best mate. I’m told that the car was being driven by a drunk driver. It had mounted the kerb and struck me; I had hit my head on the ground and was lying in a pool of blood. I was unconscious and having a fit for a couple of minutes, my breathing slow and shallow. Smack thought I was going to die. Then I relaxed and my breathing strengthening. One more metre per second, one more metre or maybe just a foot and maybe I wouldn’t be here right now to type this. It was a close thing. There is a world of difference between life and death but the line dividing them is a thin one indeed. Queen had rushed back to the club to get help and my other friends had soon rushed out. My good friend BFG had stripped out of his new Zara shirt to wrap it around my head to staunch the bleeding. Thanks BFG! I was taken to hospital where I remember my black CK jeans being removed, shorn right up the length of the legs. You know that old piece of advice from someone’s mother. Always put on clean underwear when you leave the house because you never know when you’re going to be struck by a bus. Well it turns out it is good advice. I distinctly remember being pleased to get compliments from the nurses on my blue satin boxer shorts with red love hearts all over them. Only one of the nurses spoke English and in a mad world of the unfamiliar I grabbed on to her like a lifeline. She translated the doctor’s words for me. I remember her telling me that they were going to have to insert a not-so-thin probe into somewhere thin and not-so-used-to-entry-of-foreign-objects. They said that it was not going to be comfortable. Scared, I asked them if it was going to hurt. It did. But apparently whatever reflex they were testing for was still working and to this day I’m thankful for that. I remember having my head shaved so that they could stitch my scalp together. I think I remember the eight staples going in. During the night I complained to the nurses who didn’t speak English. Somehow I dredged up my limited Spanish. Frio. Frio. I tried to convey that I was cold or hot or that my head hurt. The compression bandage that was probably keeping my brain from swelling was uncomfortably tight. The nurses did their best and what felt like hours later I think I got some relief in the form of drugs. I was told that a head specialist was going to come in and run some CT scans on me. I don’t remember much of the scans themselves; a shame, but I in high school I’d done work experience in a radiology clinic so nothing too new there. The wait for the scans and then the doctor’s opinion of them seemed interminable. In fact there’s not much worse than lying in bed not able to sleep when you yearn for nothing more than the oblivion of sleep. It’s the same whenever I have that afternoon coffee. The news was all good and I was released the next day. Most of my friends had flown on to Ibiza but I went to stay with Smack and Queen. I gave my thanks and said my goodbyes. I even got a photo with my guardian angel though I’ve shamefully forgotten her name. When I was released from the hospital I had only the clothes I’d come in with so I tried to pin my jeans back together. They didn’t hold together too well and I ended up walking in jeans with incredibly high slits in them, much like an incredibly risqué dress. The fashion hasn’t seemed to have taken hold in Valencia. My white shirt was blood stained and I must have looked to the locals like I’d been in a fight for my life. Well I do like to attract attention when I walk down the street. The blood stains washed out and I still have the white shirt I was wearing that night. Not so my love heart boxers unfortunately. Ignoring common sense I was desperate to continue my holiday (don’t let getting hit by a car stop you). The next stop was a week of partying in Ibiza. I couldn’t fly for concern over blood clots in my head so I booked a ferry to rejoin my friends. Dancing in clubs with a bandage around the head makes for an interesting spectacle. Many took it to be part of my costume. I had a great time singing and dancing with friends in Ibiza and don’t regret making that decision, immature though it may seem. Even as I write this I’m listening to and watching Big Bang and 2NE1 video clips and I just want to get up and sing and dance. There’s an energy in it; it’s food for the soul and that’s something I hope never to lose as I get older. To this day I’m not especially careful about crossing roads. I was right back on the horse so to speak. I am more aware that you need to look after No. 1 but it’s impossible to live without making some assumptions about society operating according to certain rules. Down that path lies paranoia. We walk the street taking for granted that we don’t have to be on the constant lookout for rogue cars. And for the most part it works. Truly there is no avoiding some of the things life throws our way. You just have to deal with it. Hopefully we are prepared. 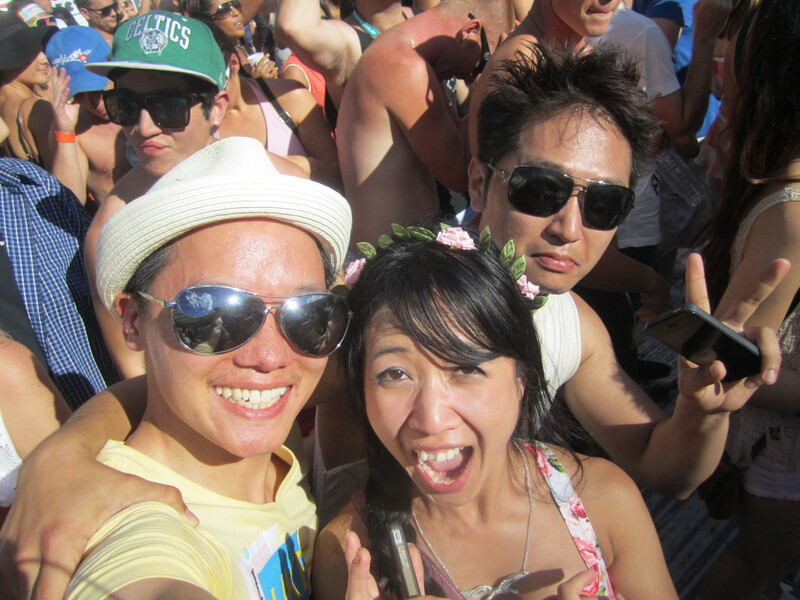 It’s been an age since I’ve written a dance party review (and to be frank it’s been a while between parties) but Stereosonic 2011 marked another fantastic party feather in my cap. Sydney weather has been miserable so it was nice to enter the arena with bright sun shining down, clouds dispersing as the DJs cranked out the tunes. Kaskade warmed us up with his smooth sounds, Avicii and Afrojack keeping up the good beats while the sun really started pouring the heat on. Thankfully it cooled down once the sun went behind the stadium and we were left to enjoy Benny Benassi’s rockin set. The big screen told us that the arena was full and that they were not allowing people in. The security guards manning the barricades made for a fun game, as PartyD and I got caught outside. Waiting till their heads were turned away we leapt from the bleachers over the barricade. High fives all round. 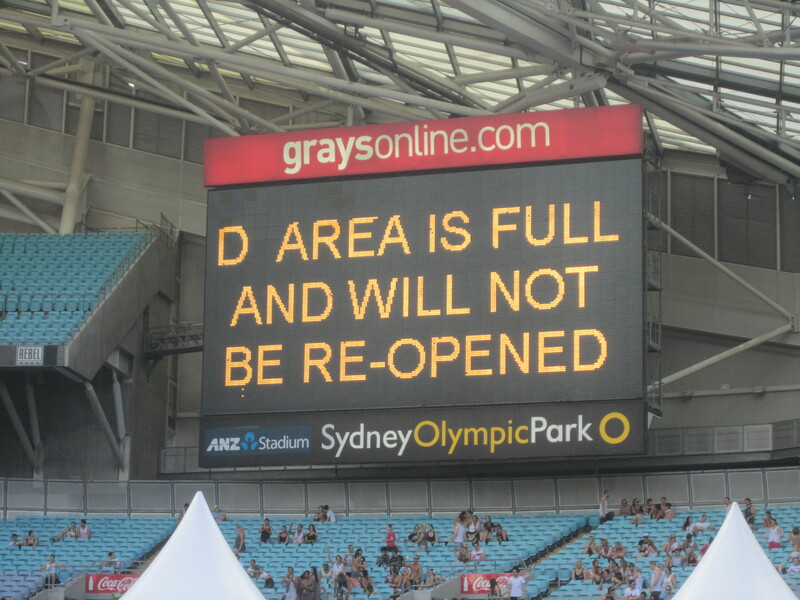 The lockout also had amusing implications for those who had stayed well-hydrated. Amusing for me anyway. Eventually my friend, The Nguyen, couldn’t hold it in any longer and was forced to make his way out to the toilets. He too was able to sneak back in to our congratulations. Another effect of the lockout was that I was forced to choose between certain DJs. I figured LMFAO looked good, leaving me able to catch an hour of Dash Berlin at the other end of the Olympic Park. Good plan. That is until LMFAO was delayed for 35 minutes. I should have caught their whole act (my friends say it was great) but instead after only 10 minutes I had to dash. When I finally found the trance arena it was like coming home. A dark room lit by flashes of bright pink, green and blue. Hundreds of trancers facing their god on the stage, worshipping with hands, arms, feet, everything. And then there was Dash Berlin. I’ve wanted to see this prolific producer for some time and he did not disappoint, cranking out hit after hit. He had me alternately bouncing, thrashing it to Lethal Industry, hands in the air and singing my throat raw. 40 minutes of pure bliss. Back at the main arena the lockout had been lifted and I made it in time for Armin’s closing. The antics weren’t over yet though. A wave of surprise flowed out from a guy who’d collapsed. And what is the first thing everyone did? Yes, they crowded in for a look. Some of them had the brilliant idea of waving their arms over their heads in an attempt to attract attention.. How anyone is supposed to take a crowd of arm-waving revellers as anything other than people enjoying the party I have no idea. I ran off to see if the security guards could be of assistance. They were not. Eventually they pointed me in the right direction but by the time I got there some other good soul had fetched the first aid. I was given the task of a blocker for my first aid quarterback (kind of fun). On our way back to the collapsed fellow the mob had decided to pick him up and get him out of there. As they carried his horizontal body past us the first aid lady had an expression I could only interpret as bemusement. I’m sure she’s seen it all. I only hope the fellow hadn’t collapsed with a neck fracture. Then again the smart money’s on the drugs. 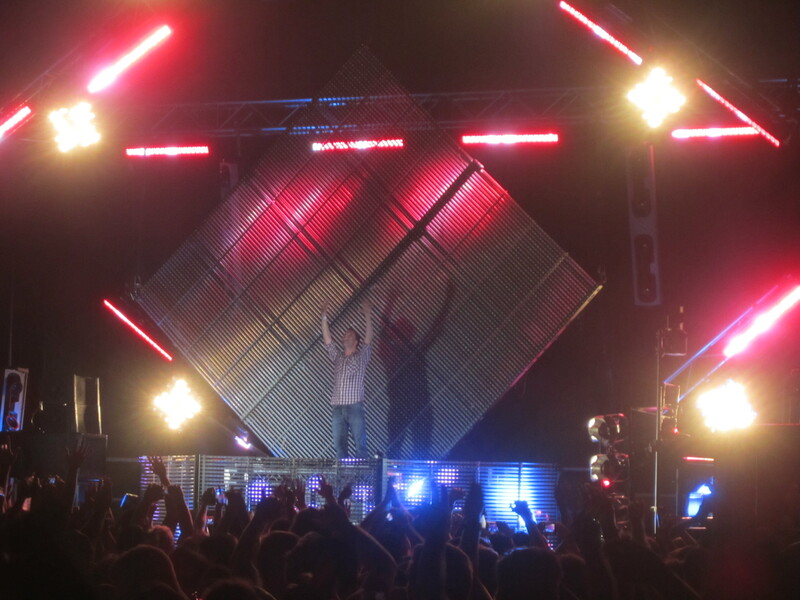 Armin played a driving set but it never reached the heights of an Armin Only performance. And no Dash Berlin. When the encore came I finally spotted my absent friends Little Miss Curious and Gonk. It turns out they’d been jumping some fences during the evening too. 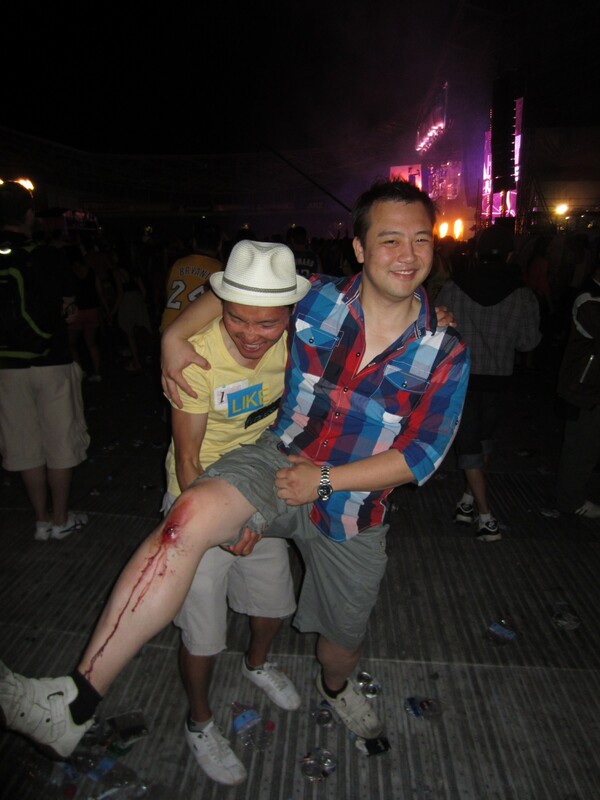 Gonk had a terrific splatter of blood running down his shin from his leap into the VIP area. All in all a fantastic day out in the sun, partying with the beautiful people. Lesson in action: If the system screws you, screw the system.